Success in today’s mobile-first world means finding new ways to build customer relationships that last. Mobile users expect their apps to add utility, inspiration, and delight to their daily lives. Helpful welcome emails, in-app tutorials, entertaining push messages, and informative web pushes are expected as a matter of course. To make the cut, brands need to embrace data-driven marketing strategies that deliver timely, personalized engagement across multiple touchpoints. Since day one, our mission at CleverTap has been to help mobile marketers form deeper, more meaningful relationships with their users. 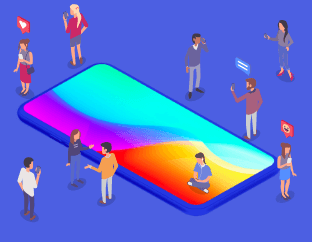 To that end, we’ve recently introduced several new features that have made CleverTap a premium solution for the mobile marketer. Pivots, Flows, and RFM Analysis give you deeper insights into who your users are, what they care about, and how they interact with your app. Advanced personalization and Scheduled & Triggered campaigns help you send relevant messages that deliver value to every user. Now we’re releasing our beta version of Journeys, a visual campaign builder that brings it all together and makes orchestrating omnichannel messaging campaigns easy. Journeys lets you build long-lived, cross-channel campaigns that reach users on the right channel at just the right time. It gives you complete control over your user’s end-to-end experience with your brand — from activation and engagement to churn and reinstall — so that you can craft an amazing user experience across the entire lifecycle. Build automated omnichannel messaging campaigns on a visual canvas. Identify any segment of users you wish to target, further sub-segment them to pinpoint your audience, and effectively engage users via the optimal channel. Create campaigns that are personalized for user behavior, location, and lifecycle stage with a few simple drag-and-drops. Compose long-lived campaigns that span days, weeks, or even months to touch users at exactly the right time and keep them engaged over the long term. Get a live view of your campaign to see users flow through each stage in real time. What Can You Do with Journeys? Every message you send users has a purpose. Whether it’s to encourage a purchase, pique interest in a new feature, or prompt them to interact with new content, success means engaging users with different messages across multiple channels, at the right moments. Not to mention personalizing your messaging based on that user’s interests and past actions. Journeys provides a way for marketers to account for all possible user actions at every stage — and adapt your engagement strategy accordingly. 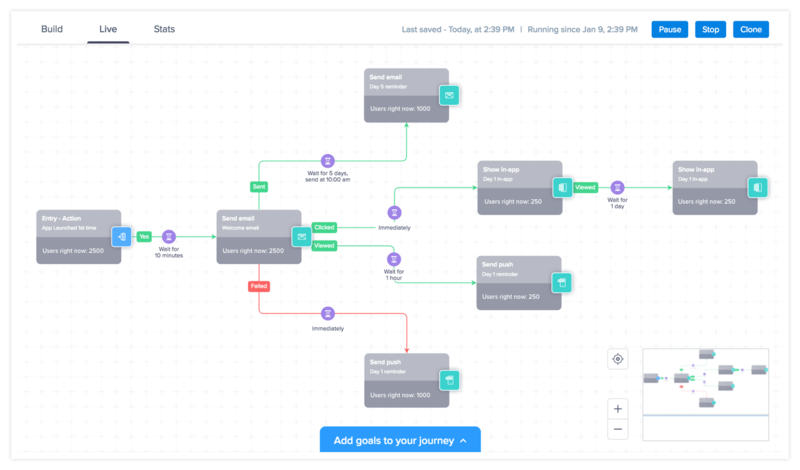 This example shows an onboarding flow that spans email, push, and in-app messages sent over the first five days of a new user’s experience. It provides one path for users who open a welcome email and sends a push notification to those who don’t. The entry criteria for this Journey is set to new users who launch the app for the first time. Shortly after (30 mins) each user’s first experience with the app, they get an email thanking them for downloading and giving them pointers on what to do next. But to fully onboard and educate new users, it may take multiple touchpoints across different channels over the course of several days. For example, users who click on the link within the email will immediately be shown an in-app welcome message and brief tutorial, while those who view the email but don’t click will get a push reminder an hour later. Users who receive but don’t view the email will get a follow-up email five days later. And for users whose email deliveries fail, a push will be sent immediately to bring them back into the app. Each user is engaged via the ideal channel and message cadence to boost activation and long-term retention. Here we show a comprehensive onboarding campaign with multiple conditions and channels — all created with a few drag and drops on the visual editor. Target users with custom offers based on their specific in-app actions to drive conversions. This campaign sends a free shipping promo to new users who view their first product page and includes fallbacks for users who have opted out of push to be engaged via email and/or SMS. This campaign includes a fallback email message in the event the push notification fails, and a secondary push for when a push is sent, but not clicked. Click the Journeys link in the left navigation bar of your CleverTap Dashboard (in the Engage menu). You’ll see an overview of all current Journeys, their status, and a variety of campaign and performance statistics. Click the three-dot menu beside each Journey for options to view reports, edit, clone, and start or stop a Journey. To create your first Journey, click the “+ Journey” icon to launch the visual editor. Just drag and drop from the Segment panel to define your entry criteria. These are the conditions that will determine which users will be included in your Journey, or the user segment you want to target. This could be new users who launch the app for the very first time, users who complete their first purchase, or users who have been inactive for a set period of time, to name a few examples. When you’ve finished entering your segment details, CleverTap will prompt you to name your entry criteria. We suggest you choose a name that’s identifiable so that when you view your end-to-end Journey, there’s enough detail to understand each stage of the campaign’s flow. (“First Time Users” and “Premium Upgrade Push” are much more helpful than “Entry Criteria” and “Push Notification 1”). If you choose, you can also set optional Exit criteria (or “Goal”, as it’s labeled in the User Interface) to define when users drop out of the Journey. For instance, if a user makes a purchase, they can be automatically dropped from the Journey, so they don’t keep receiving future messages. Hover over each stage of your journey to view branch conditions, or to delete a step in your campaign. Next, drag and drop from the Engage panel to determine which messages users who meet your entry criteria will receive, on which channel, and when. Click to configure and add details to your message, using all the powerful customization features of the familiar CleverTap Messages UI. Create A/B tests and localization details for push notifications, set frequency caps, and compose notifications complete with rich media and emojis. You’ll notice each branch of your campaign includes a time widget. Click the hourglass icon to schedule when each message will be delivered, or set a delay. For instance, wait one day after a user creates a new music playlist before sending an email recommending related artists. Click the save icon to save your progress, or publish to make the Journey live. Then let CleverTap do the rest. Once a Journey is published, you can click on the Live and Stats views to get real-time insights into campaign performance. Get a real-time snapshot of how many users have qualified for the Journey, where they are at each stage, and who has received each particular message. View detailed stats on campaign performance, including conversion funnels, error reports, and other drill-down stats for each stage of your Journey. Journeys, which will be available in the Enterprise plan, is now accessible in beta for a limited time to all customers. We’re excited to see how you use this powerful new tool to build better relationships with your users, so please tell us what you think of Journeys in the comments below!